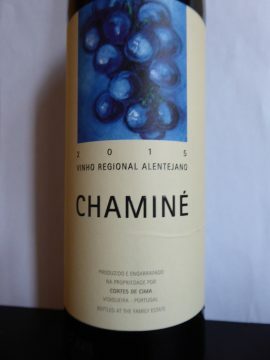 Chaminé is a red wine blend produced in Portugal by the Cortes de Cima winery with the Vinho Regional Alentejano based mainly on Aragonez (the Portuguese Tempranillo) and Syrah grapes. 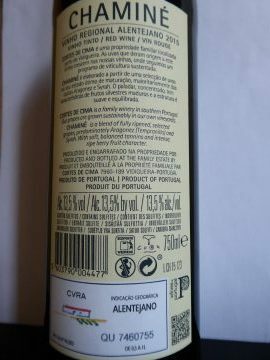 Its 2015 vintage has dark color and a strong nose that charms you with black berries (dark cherry, blueberry, blackberry) and licorice. The mouth is smooth with fruity aromas, lacking some length and complexity from my perspective. 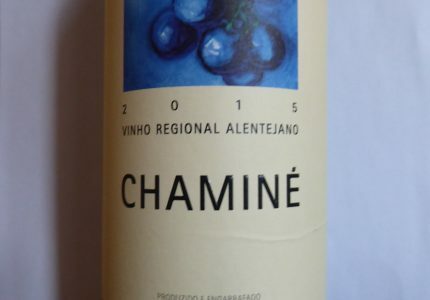 The final overall impression is however very good for this Chaminé 2015, a red wine from Portugal that provides a lot of simple pleasure for a reasonable price. Excellent wine with a good price-quality ratio to go with a nice grilled piece of beef.